For the third time the EHF Competence Academy and Network (EHF CAN) organised a Club Management Seminar on the fringes of the VELUX EHF FINAL4 in Cologne. High ranked lecturers from all departments of sports, marketing and media gave insight views on several topics related to the needs, no-gos and musts of social media channels like Facebook, Twitter, Youtube or Instagram - and how clubs can profit from their usage. 20 representatives of clubs, leagues and federations from all over Europe took part in the three day seminar, conducted by Helmut Höritsch from the EHF Office. In a key note, opening the seminar, Dr. Christoph Bertling from the German Sports University gave a lecture about “handball clubs as media companies”, analyzing the media matters and media management tasks clubs and federations have to be aware of and to fulfill. Presenting, how pictures, videos, blogs or articles can be used in all terms of social media, Sierau also explained how exclusive content can create a certain impact on fans, sponsors and media. The general opinion of all participants was that “you have to do something in social media”, regardless the financial opportunities of a club or federation. “You have to enhance the community, involve all stakeholders in your social media concept and use all possible technical devices,” was the key message of Sierau and Höritsch. JJ Rowland, Head of Media and Communication at the European Handball Federation, gave an in-depth view on the media and communication strategy of the EHF, including all tools from website, social media, ehfTV.com and involving fans and media under the general approach of handball as the most electrifying team sports in Europe. On the second and third day of the seminar, best practice examples like of the German Olympic Sports Federation or the football club 1. FC Köln (winning several awards for its social media campaigns) were in the focus - permanently followed by the presentation of examples of the seminar participants. “The discussion with the participants and the input from the lecturers was a great help to adapt and improve our social media strategy for the future. There were a huge number of examples we can easily implement in our daily work. I was really inspired by the seminar,” Elena Borras (Royal Spanish Handball Federation) said. In the end the participants did not only listen and explain the strategies in their clubs and federations, but also had to pass an online-based test to receive the club management license. “This license is another part of the whole education system of the EHF and the EHF CAN,” said Höritsch, who also had presented all possible tools of education of CAN and its partners. 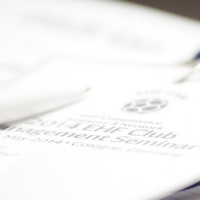 The entire documention of the Club Management Seminar is available for download.